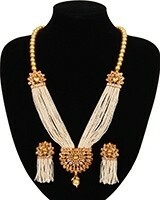 Malas & rani haars are longer Indian necklaces which generally sit on top of an Indian clothing and reach down to the bust. 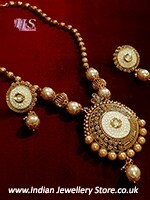 Malas are strands of pearl, crystal, or metal beads in gold plate, silver or antique gold. 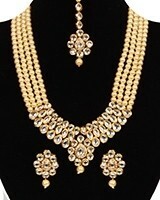 Mala necklaces can have ornaments within the strands for decoration, these can be decorated with kundan, polki, crystal or American Diamond stones. 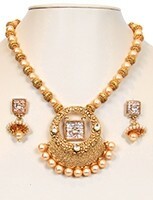 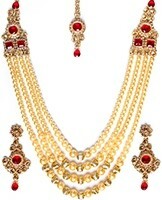 A rani haar is also a long style Asian necklace but here the chain is typically made from metal and there is a distinct pendant attached to the base of the chain. 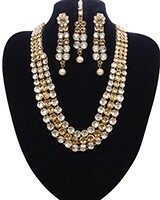 Rani haars and malas offer a traditional & regal Indian look, they also sit well ontop of a saree of chuni - this makes them a popular choice for Indian brides and during religious festivals.